1956 had been tremendous for Elvis, and by the end of that year there still seemed no end to the meteoric rise of his popularity. Elvis’ first movie (‘Love Me Tender’) had just been released nationwide and it had broken all kinds of records for 20th Century Fox. 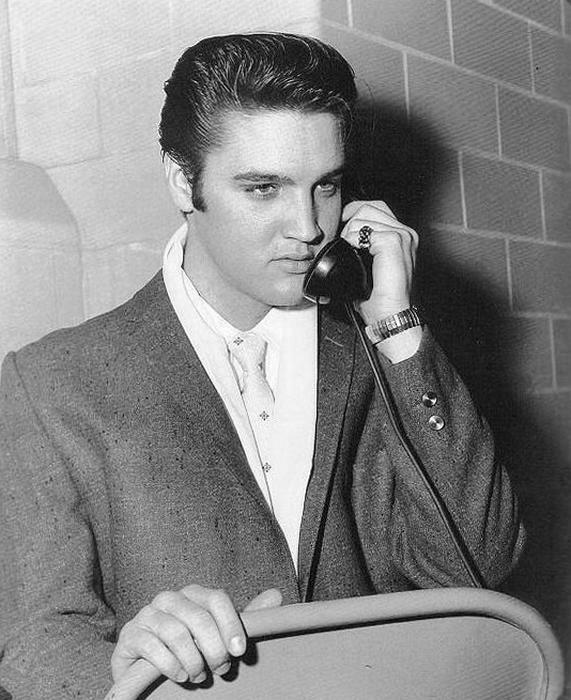 Elvis Presley was also the most played artist on the radio, and his second album (‘Elvis’) had recently made Number 1 on the Album Chart while the titlesong of his first movie had also reached that same spot in the previous month. 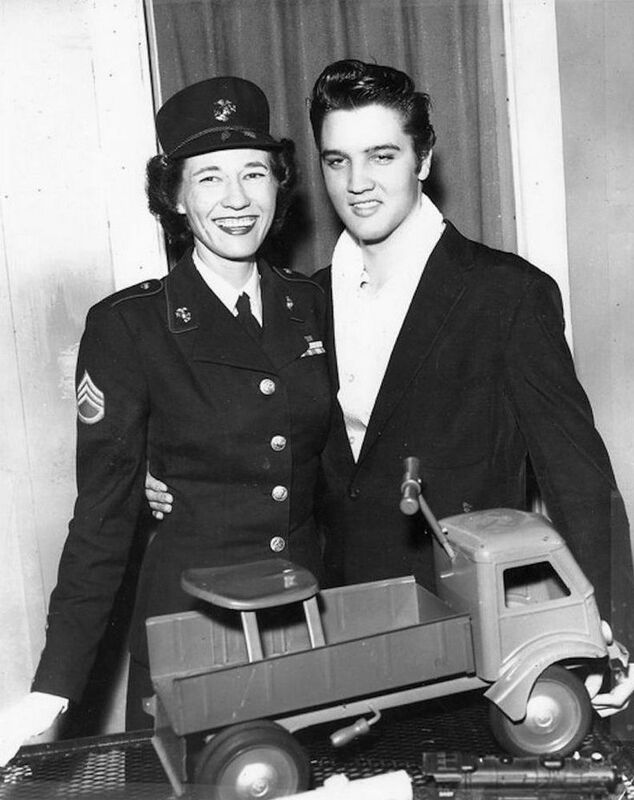 Next to that, the Elvis Presley Enterprises merchandise-train had proven to be an extremely succesful formula for marketing Elvis Presley as a brandname. Elvis was all over the place, and where ever he (or his image, or his name) went, big bucks were being made. 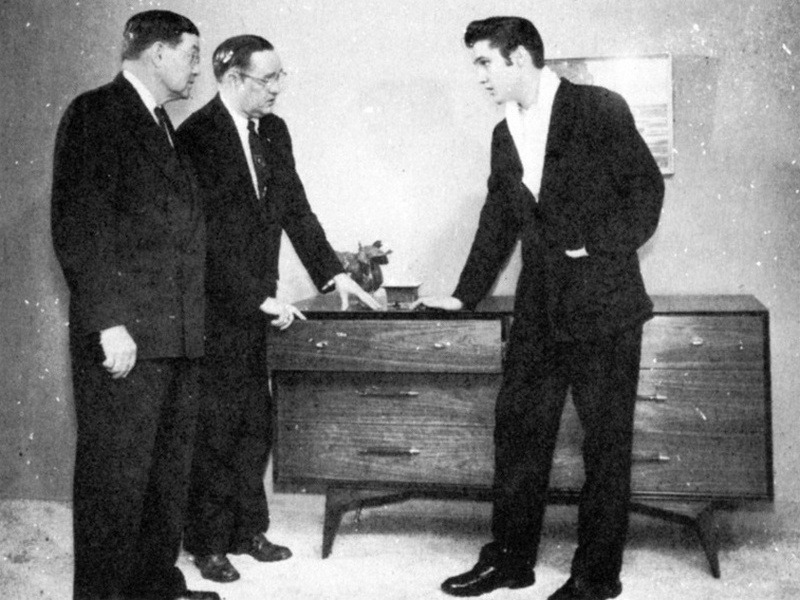 So by December 1956, it made perfect sense that the Memphis based HUNGERFORD FURNITURE COMPANY had chosen Elvis to be the focuspoint of their huge upcoming marketing campaign. But did it really make that much sense? 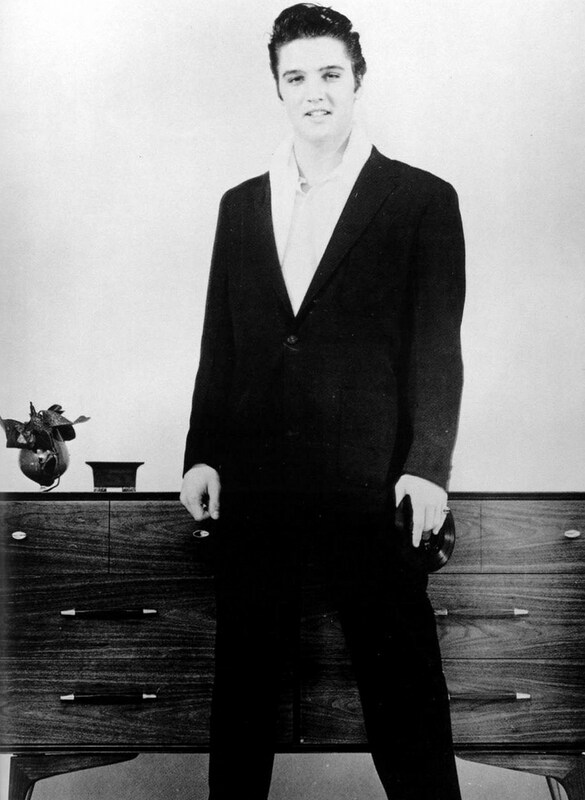 Even though Elvis was hired to do an official Photoshoot for Hungerford on DECEMBER 12, the campaign never emerged. Hungerford jumped on the very successful bandwagon of their hometown’s most famous citizen in order to cash in on his enormous popularity. But the powers that be at Hungerford eventually decided that the fans of Elvis would rather spend the little pocketmoney they had on EPE merchandise and RCA records, and not on expensive mahogony furniture. And the mahogony buying public (a.k.a. 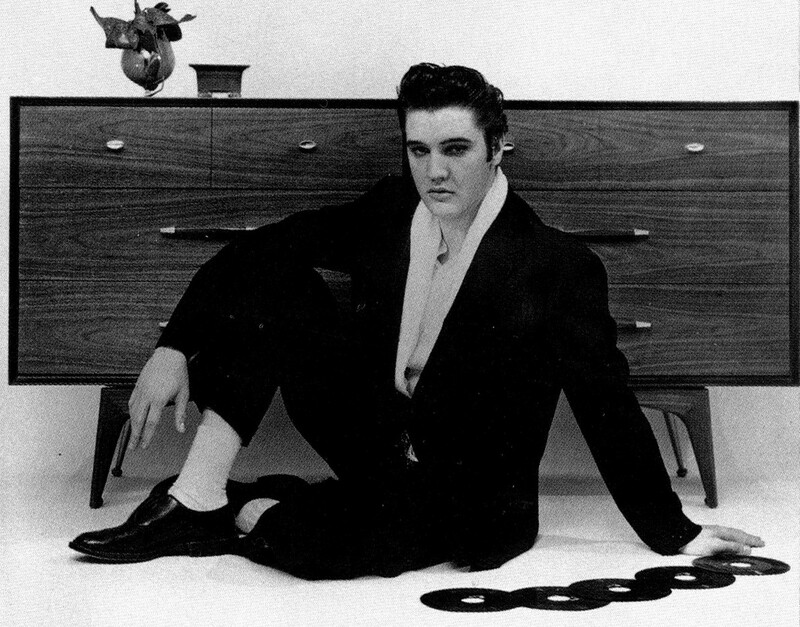 ‘adult America’) would probably even boycot their products once this wild kid from Tupelo became associated with them. Hungerford should have saved itself the time and money and hire Perry Como or Pat Boone’s face instead. 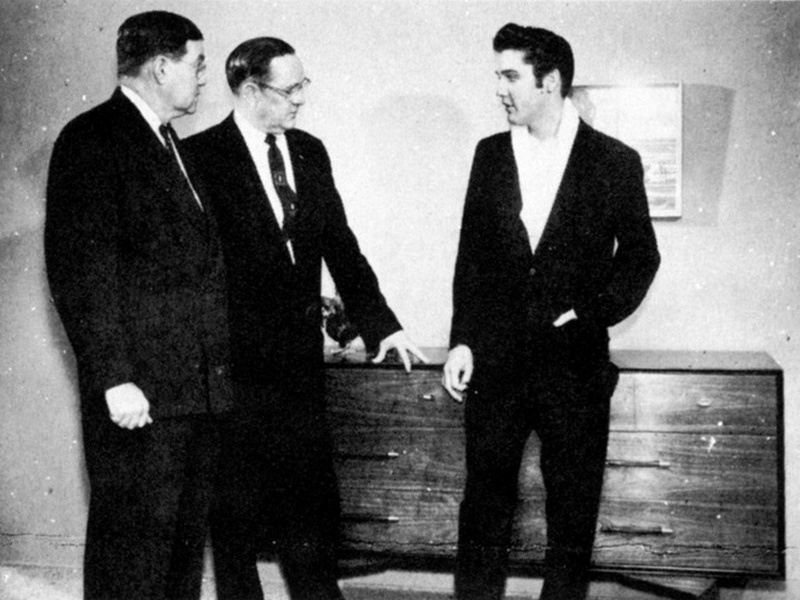 In this article we take a look at the photos that were done during THE PHOTOSHOOT (in which we mainly see Elvis posing with the company’s executives while standing in front of a dresser) shortly before the Hungerford Company suddenly abandoned their Elvis-campaign. 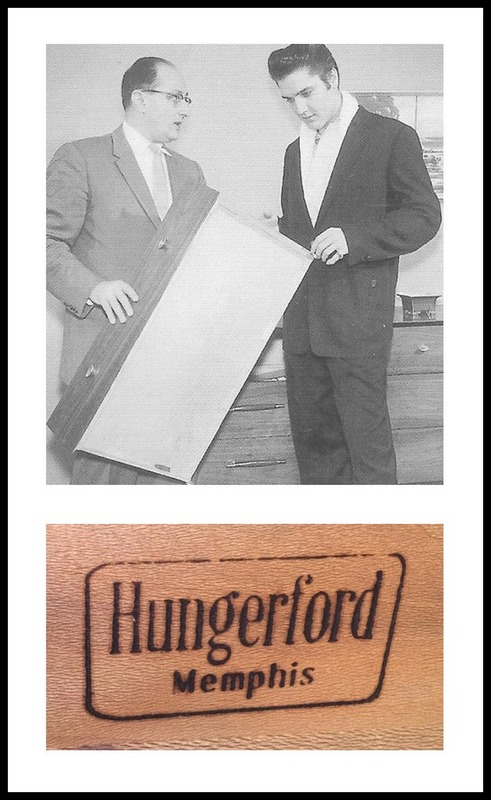 But did Hungerford really abandon the campaign before it was launched, or did a small amount of products from their Elvis-line find their way to the public in early 1957? Enjoy the most complete collection of photos from what would have been the only time Elvis physically endorsed a product other than his own. The photos were taken by WILLIAM CARRIER of API Photographers in Memphis. 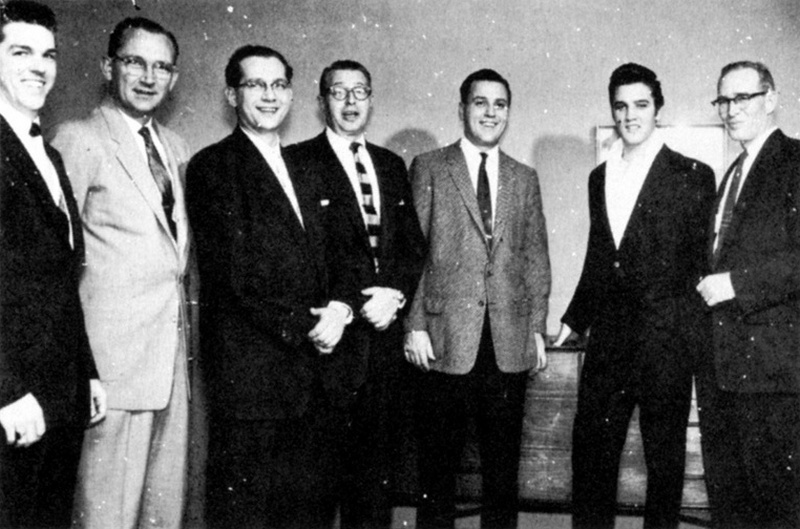 Here we have the first set of photos of Elvis posing with six Hungerford executives. 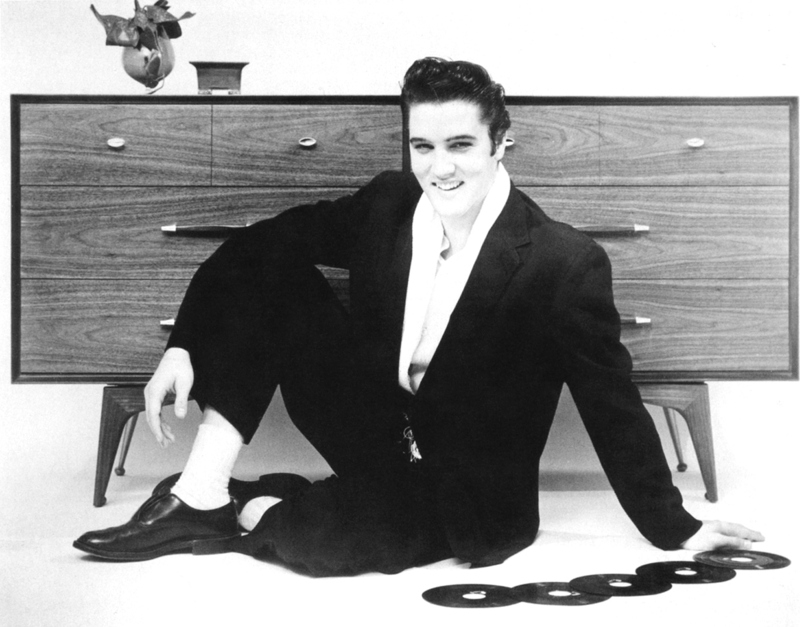 Elvis is wearing a black suit with a white scarf, which gives him a rather sophisticated look. Notice in the first two images how Elvis is the only person looking at the photographer. And in the second photo we can see that Elvis probably made a funny remark since he is the only one talking while the others are laughing. Image nummer three is your typical ‘say cheese!’ photo. * Last year (when I originally started working on this Hungerford article) I was in contact with a very nice lady whose husband’s father can be seen in these three photos. Due to a nasty computer-hack I lost a huge part of my Echoes archive as well as the contacts in my outlook including all correspondance with this lady. I sincerely hope that she will one day notice this article and get back in touch with me. Three more photos, this time with two different execs. 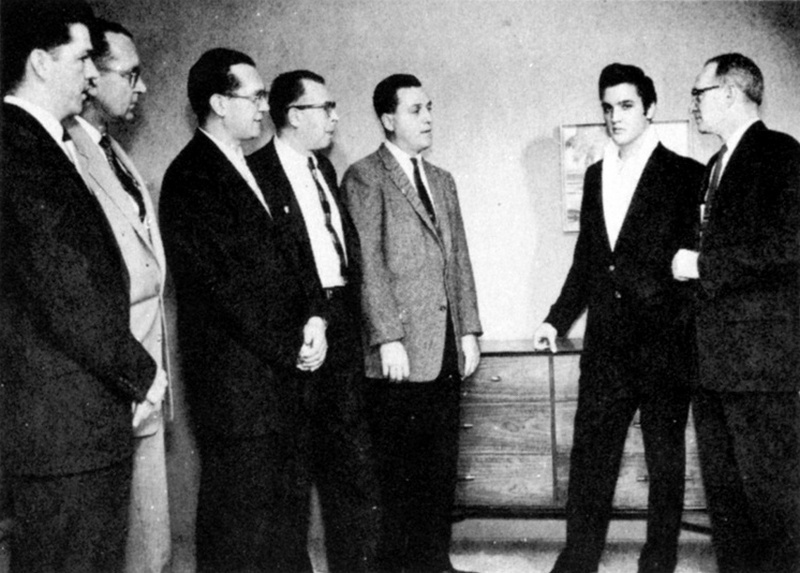 Elvis, with one hand in his pocket, looks very smooth and completely at ease. The same can certainly not be said of the two gents who seem to feel uncomfortable being around the hipshaking babe magnet. Just take a closer look at photo number three! 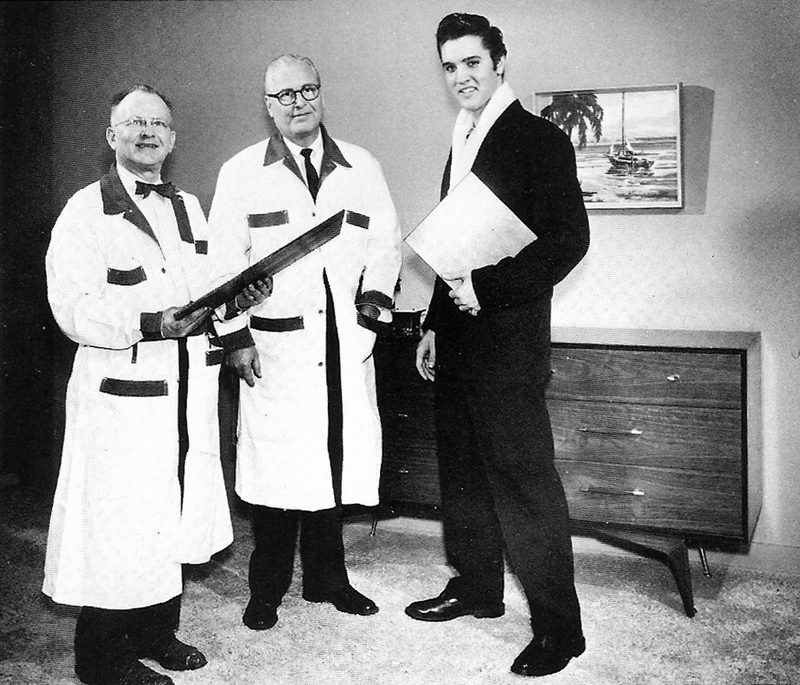 Four photos this time, but only one company man (probably a high official) posing with Elvis. Here is the last set of photos in which other people can be seen posing with Elvis. 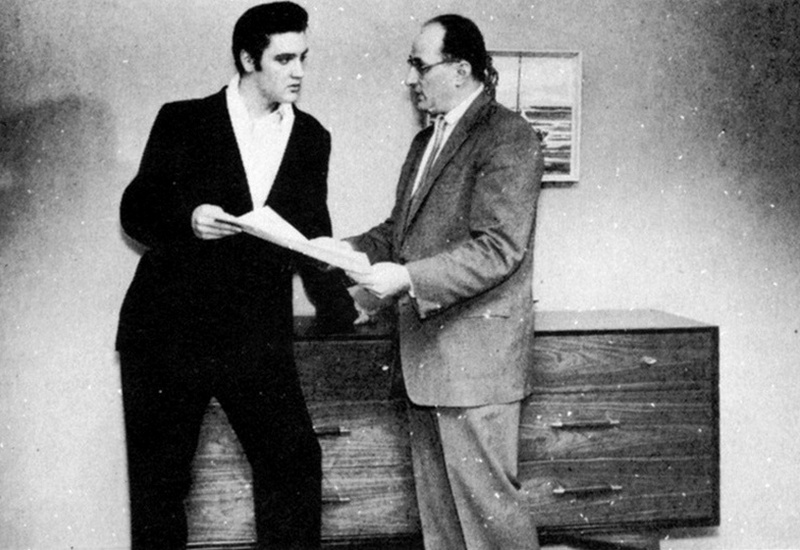 In the photo to the right, Elvis (mainly because of the stuff under his arm) appears to be the business executive here talking to his staff. And are those LP albums? 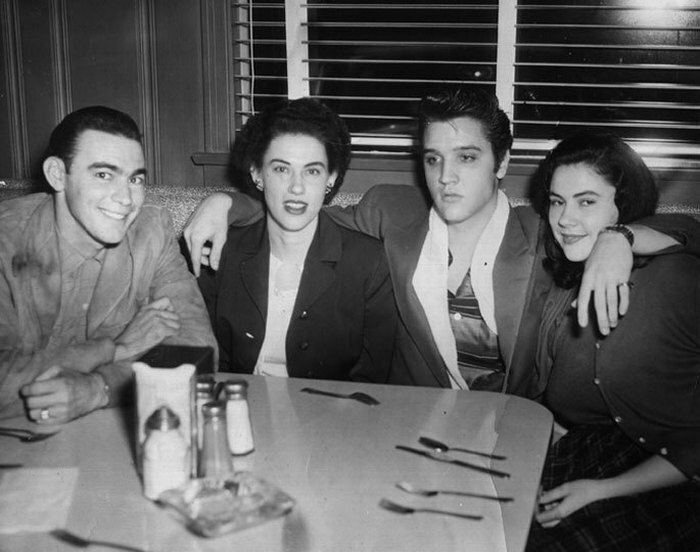 (At least) Five solo shots of Elvis are known to exist. 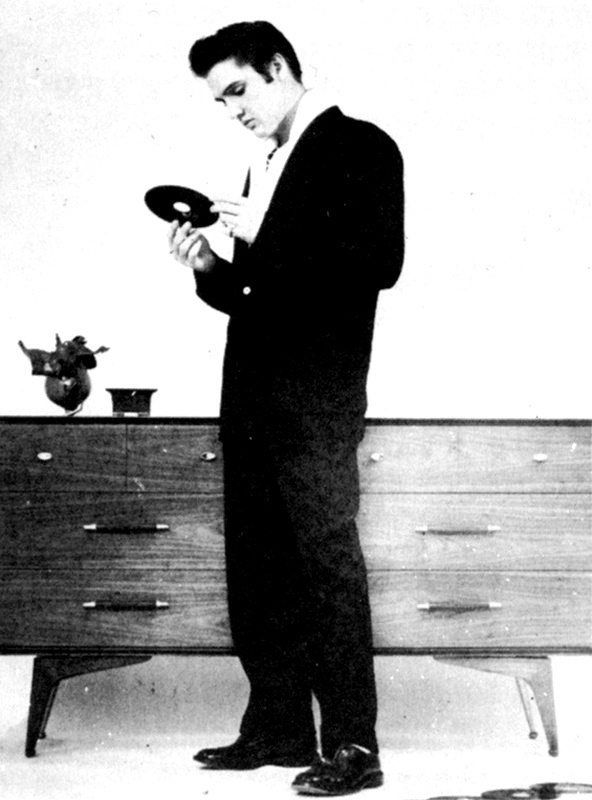 In the two photos below (of Elvis seated in front of the cabinet) we can clearly see Nipper on the singles. 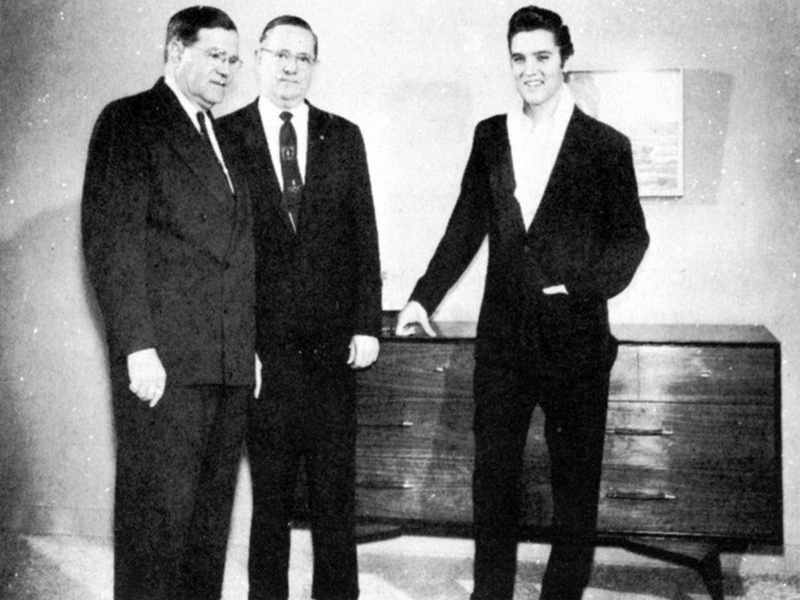 It is generally assumed that the Hungerford Company abandoned their Elvis campaign right after the Photoshoot had taken place, and no Hungerford furniture with Elvis’ name on it has ever shown up in auction (at least not to my knowledge). Next to that also no official Hungerford/Elvis campaign folders or flyers have ever surfaced. Same goes for any magazine or newspaper advertisements promoting Hungerford’s Elvis line. And what ever happened to the original prints and negatives of the images that were produced during the Photoshoot in December 1956? Apparently they were locked up in a safe at Graceland and not seen until after Elvis’ death. 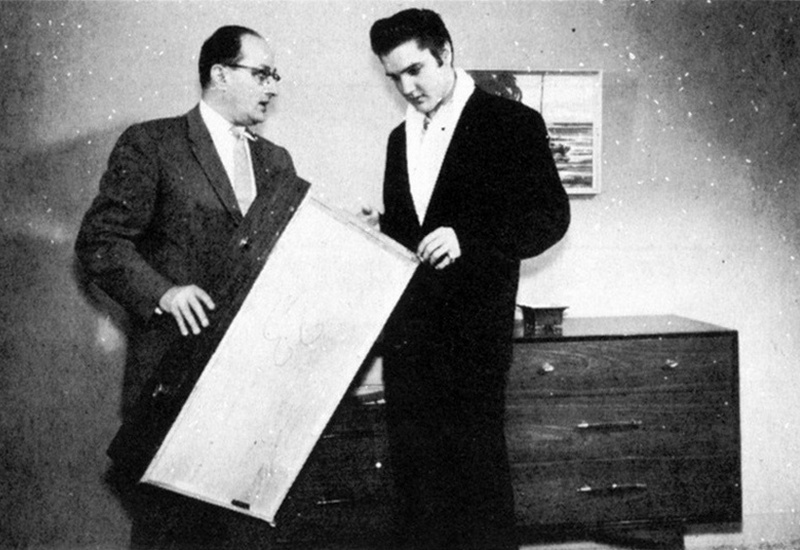 However, while doing research for this Echoes-article, I managed to dig up a vintage newspaper (that is available online) in which Hungerford’s connection with Elvis gets a mention. It might shed a bit of light on the question whether the campaign was abandoned before it got started or that Hungerford did in fact start their Elvis-campaign but pulled the plug at an early stage. This newspaper article (dealing with the latest in home furnishing design, not aimed at the general public but at wholesalers) is from about 4 weeks after the Photoshoot had taken place and gives the impression that Hungerford put their Elvis involved marketing strategies into action for at least a short while. The white scarf Elvis is wearing during the Hungerford photoshoot has fascinated me over the years, and I guess I always assumed Elvis was especially ‘dressed for the occasion’. But he can in fact be seen wearing that same scarf in the days prior to the shoot. First we have the off stage photos from his final appearance at the Louisiana Hayride, plus there is of course also the famous photo of The Browns with Elvis at The Trio Club in Pine Bluff, Arkansas. 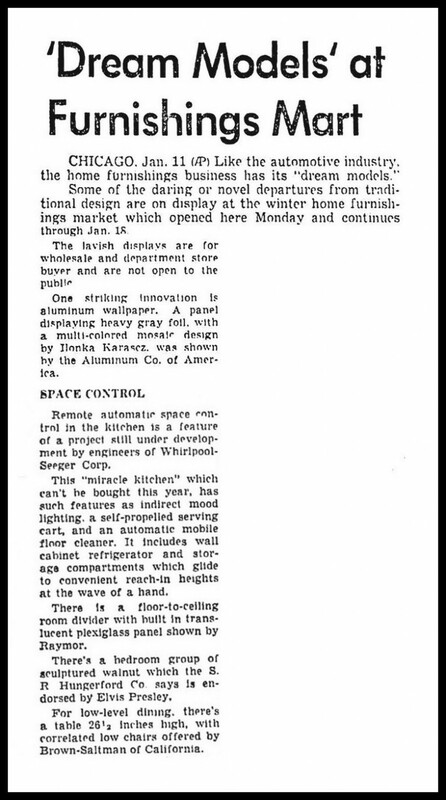 To conclude our look at December 12, 1956, we have a very nice photo that was taken on the same day. 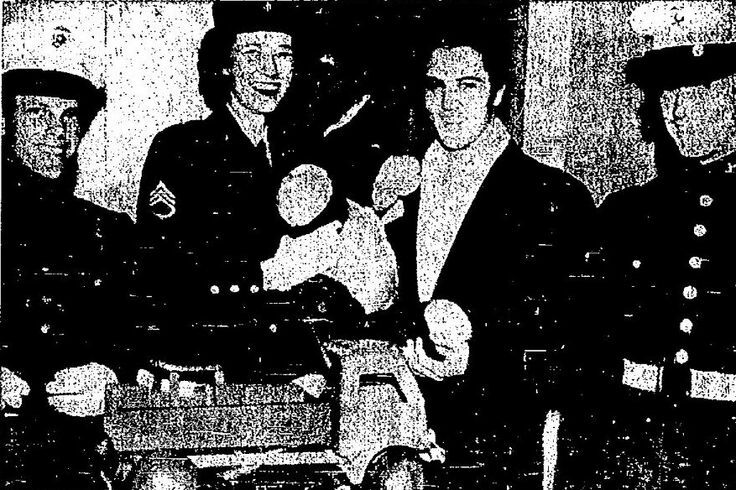 We see Sergeant RUBY MAXWELL posing with Elvis and some of the toys he donated for a good cause in aid of children in need. 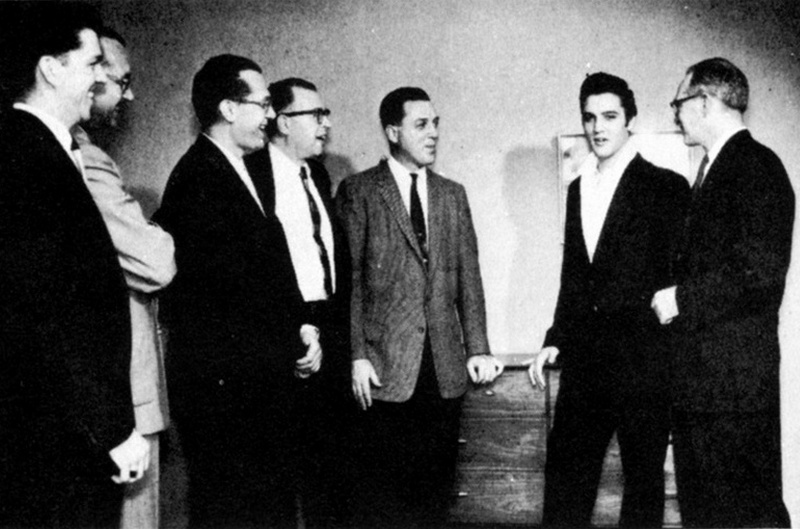 The gentleman to the right in the lousy image below (probably copied from a newspaper article) is someone who in the near future will make quite a name for himself amongst Elvis fans: RED WEST. Again, a wonderful story and very cool pictures. I had always thought Elvis wore the white scarf only on this occasion, so thanks for the background information and additional pictures. First class – I’ve never seen so many pictures from this shoot – Wonderful! Nothing wooden about this work. Superb! I enjoyed the story! I had heard part of this from the Elvis expert Jeff Schrembs (of http://www.ElvisCollector.info) who says good things about your site. I´ll check back in the future! 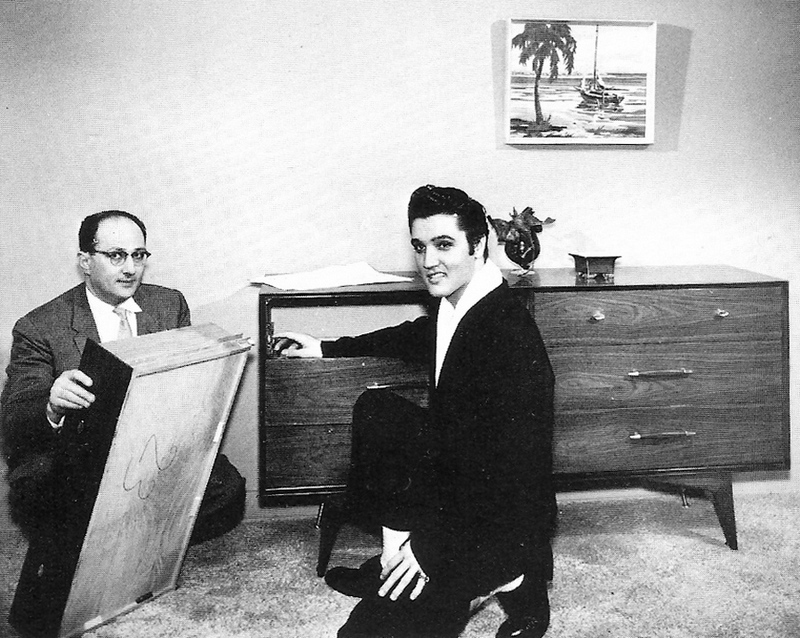 I don’t think it’s an LP Elvis is holding, but a sample of the different kinds of wood the furniture came in, the other man looks to be holding two of them. Thanks Bob. Solid and kool! I have a trade magazine with a full page ad for this range, with elvis picture and also a short article by the company. I would love to see pictures of what you have! I have a piece of Hungerford furniture that looks very similar to the one pictured. Does anyone know if the line of furniture was actually produced or do I have a rare piece? Thanks! What a great article and story! I am an Elvis fan and loved this information. But I came across this article because I was searching google for information on Hungerford Furniture. Turns out I have a piece that matches exactly the design and style of the piece photographed with Elvis. The same legs, the same pulls, same beveled wood around the drawers giving it the framed looked. My piece is narrower and a taller 5 drawer dresser. Ironically, when you search for hungerford on google this article is almost all there is to find on Hungerford Furniture. 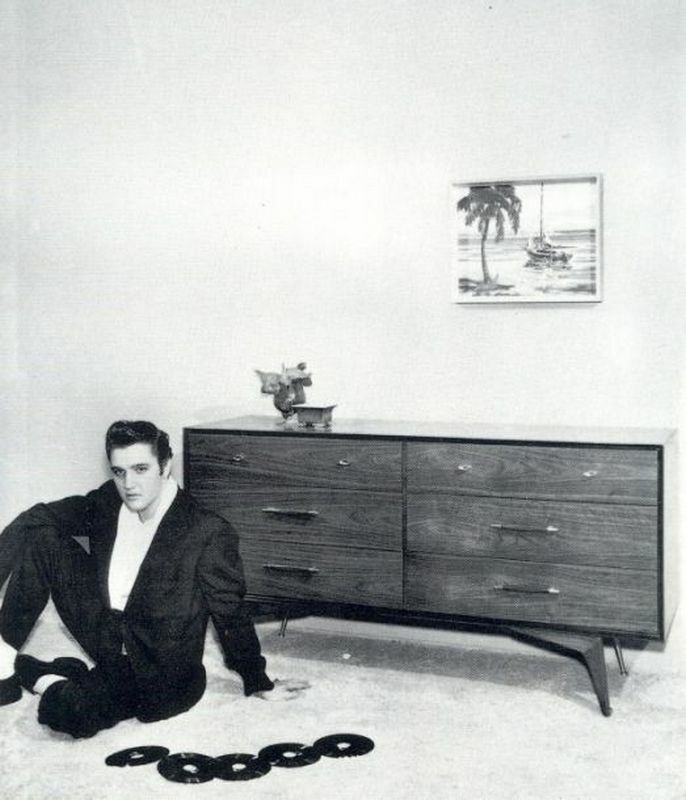 I am looking for information hungerford furniture, in particular information on the furniture pictured with Elvis. Whether or not this is the line that was going to be the “Elvis” line is not as important as much as what I can find out about the piece itself and the company history. Can anyone point me in the right direction? Go to YouTube and Search for “Spa Guy”, who is one of many Elvis experts. He JUST did a YouTube Video on Elvis and the Hungerford Furniture story. The Spa Guy Video is dated March 22, 2018. 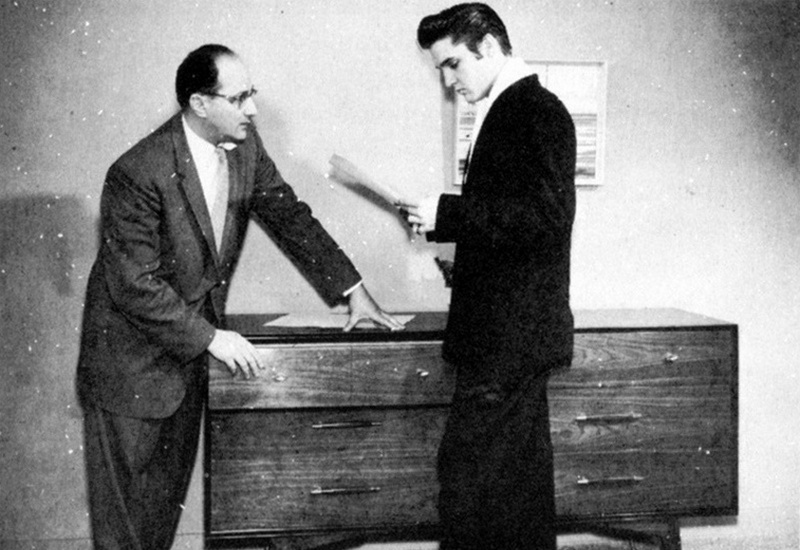 The Video is called: “Elvis Presley Hungerford Furniture Campaign William Carrier The Spa Guy Part #1”. Part #2 will be coming soon. These rare and wonderful pictures actually make my heart beat faster. How great and interesting this article is! How wonderfully photogenic he was! So excited and happy that success was opening the world to him. Time does not diminish how much we love and miss him. I have loved him since 1956 and I will love him for eternity. It is indeed a small world! My childhood sweetheart and first husband, Don Holland worked as the warehouse asst. mgr. for Hungerford Furniture in the early 60’s. The mgr. was Billy Lamonica. 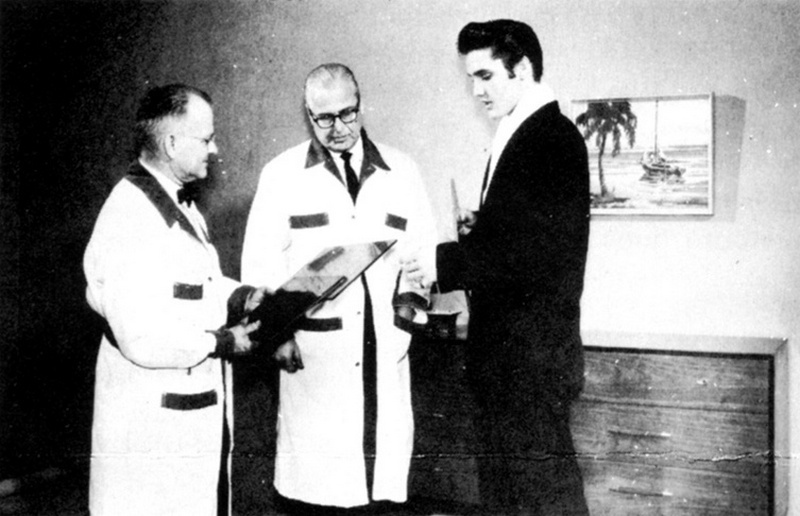 Now the good part … Elvis’s first job was as an usher at Loew’s State Theater. My Dad, Arthur Groom, was the manager of Loew’s State. 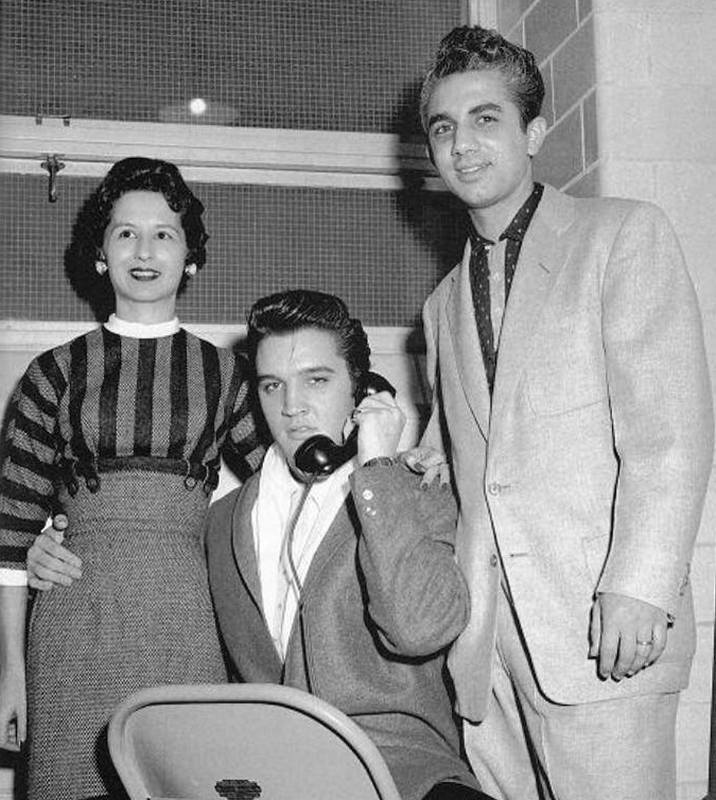 Later he fired Elvis and another usher, Luther Nall, for shuffling over the candy girl!!!!! 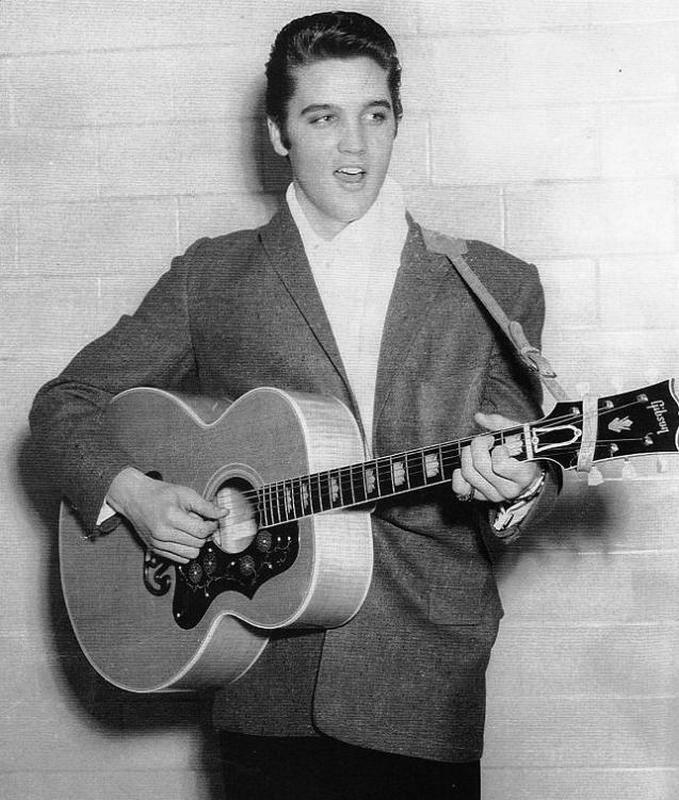 I am 72 years old, I met Elvis at a late night private showing Daddy arranged for Elvis and the entourage and many many friends, to watch Love Me Tender!! I was ten years old then! Elvis was so sweet to me and gave me many nice Elvis Presley items and photographs!!! I have just recently bouth a 7 drawer desk, and on the inside of the top middle drawer their is the Hungerford logo, and it also has another tag verifiying that it is made out of mohogany with the number of 332. Can you tell me anything about this dresser? N.Y. and has S.R. HUNGERFORD CO. Memphis TN and it is dated JAN 1957. It appears to be an original photo and I was wondering how collectable these are.